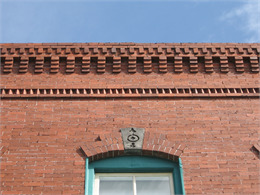 Brick cornices can vary from quite simple to very ornate. Source: Phil Thomason. 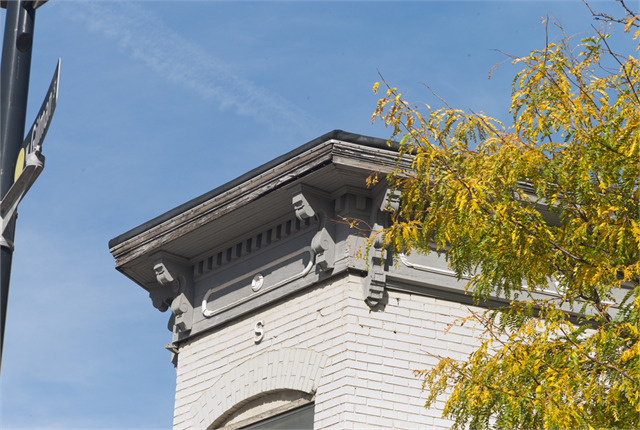 Your historic commercial building may have a decorative feature along the roofline known as a cornice. Cornices can provide great texture and embellishment to your building’s appearance. You should preserve your cornices as an important character-defining feature of your historic building. However, if your building did not have cornices historically, you should not add them to your building. Cornices have been used in architecture as decorative roof elements for thousands of years. They became an important component of commercial buildings in the 19th and early 20th centuries. As downtown commercial districts evolved, emphasis was placed on having attractive main facades on relatively narrow building widths. Buildings were often designed with separate storefronts and upper facades. The upper facades often had windows and decorative elements, including cornices. A variety of cornice designs were developed that reflect the age and style of different buildings. Cornices have gained one new purpose in the modern age. With the invention and installation of mechanical equipment such as heating and air conditioning units, cornices have become visual screens to conceal these modern conveniences from view on the rooftops of commercial buildings. 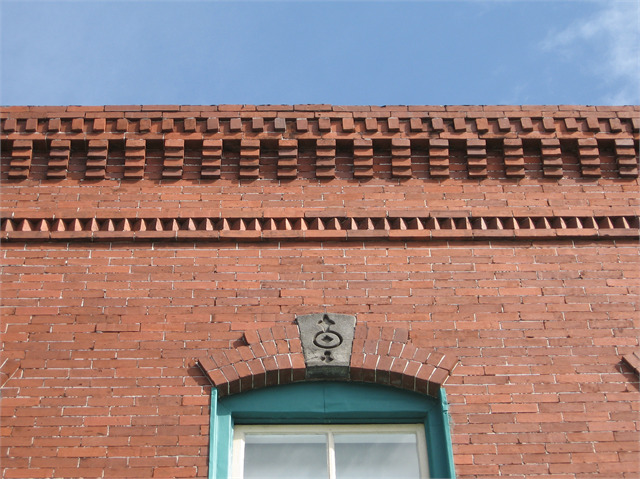 A terra cotta cornice on a brick masonry building. Source: Phil Thomason. The traditional materials used for cornices on commercial buildings included sheet metal (such as tin), wood, concrete and brick. Wood frame commercial buildings from the 19th and early 20th centuries are likely to have cornices of wood or sheet metal. These cornices were milled or formed into a variety of shapes such as brackets or modillion blocks. Brick commercial buildings may have corbelled cornices — rows of brick that project from the wall in various bonding patterns. In the early 20th century, other materials became popular for cornices, including cast concrete and terra cotta. 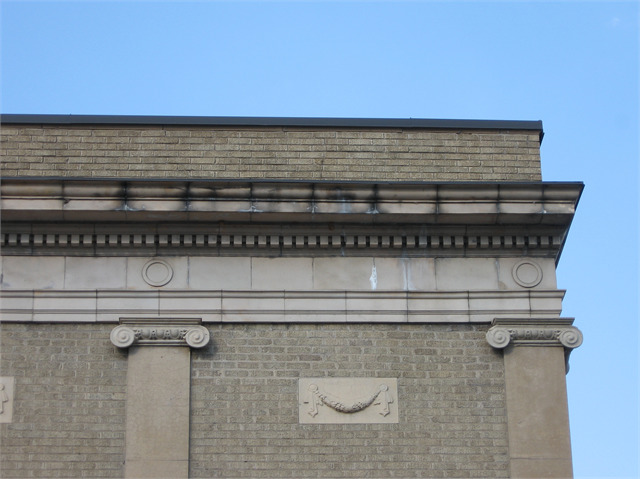 Like any architectural element, cornices can deteriorate through lack of maintenance or water infiltration. You should inspect your building cornices on a regular basis to make sure the materials are in good condition and do not have any water penetration. Madison, Wisconsin. Wood, like sheet metal must remain painted in order to maintain its structural integrity. Source: Photographer Mark Fay. Wood cornices are particularly prone to deterioration if they are not regularly painted to seal out moisture. Wood and sheet metal cornices are typically attached to the building with wood or metal anchors that can decay or rust if they are not maintained. If your wood or sheet metal cornices become deteriorated, you should repair them with materials that match the original. Milling and sheet metal companies are often able to repair or replace an existing cornice with matching new materials. The rear of a cornice is often directly attached to the roof material. You should inspect the joints where these two materials come together on a regular basis. 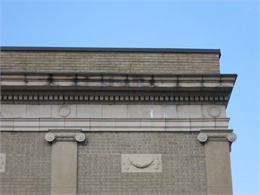 Cast concrete and terra cotta cornices are anchored into the masonry of the building. It is especially important to keep water out of these types of cornices to prevent them from rusting or detaching from your building. You should repair cast concrete and terra cotta cornices with materials to match. Alternative materials such as fiberglass or fiberglass-reinforced concrete may be appropriate for some buildings. Since cornices are at the tops of buildings, observers at the street level will not be able to easily distinguish these alternative materials from original materials. Preserve and maintain your historic cornices. Do not remove, conceal or cover your original cornices with modern materials. Cornices are prominent, visible and often decorative features of historic buildings that help to define their character. Maintain and repair your cornices with similar materials. Do not add cornices to your building if the building never had cornices. If you add features like cornices to your historic building that were not there originally, these features will detract from your building’s architectural integrity. Match the original style, materials, size and design to replace missing cornices. If you must replace a missing cornice, match the original cornice on style, materials, size and design. If all of your cornices are missing, seek physical or pictorial evidence of the original design so you can have a replacement cornice designed that will match the original design. Your local historical society or archives may have historic photographs of your building that will show you what the original cornice looked like.